Lashings World XI....their modest pavilion facility in the background. The following article was originally published in the 2011 Lashings World XI Match Day programme. From humble beginnings as a ‘village’ cricket club in Kent, Lashings has evolved into a worldwide phenomenon. Essentially a touring international cricket team, dedicated to supporting the grass-roots of the sport as well as many charities, it has coincidentally created the perfect platform for business development. Many highly respected UK and international brands have been quick to recognise this unique environment. Back in 1984, Maidstone-based businessman David Folb was in the Lashings Bar and Restaurant on a Saturday night when he heard about the plight of the nearby Minstrel Wine Bar’s cricket team, who had a match scheduled the following day but had just lost their opposition. Not wanting to see them miss out on their Sunday afternoon fixture, Folb appointed himself captain and wicketkeeper, made a few calls and assembled an opposition. A motley crew of customers, friends, solicitors, bank managers and even Lashings restaurant manager John Tobin (an Irishman who had never played cricket in his life, and indeed hasn’t since!) were roped in to play and appeared the following day in the less-than-idyllic surroundings of Mote Park. It wasn’t quite a dream start for Folb’s new venture though, as the team that were to become known as Lashings fell short by a mere 294 runs! However, the experience was enough for Folb’s band of merry men to catch the bug and soon there were enough personnel to be able to put out a village team on a regular basis for several years, eventually reaching the dizzy heights of the Maidstone and District Riverside League! Fast forward to 1995 and Folb’s business commitments had taken him to Antigua, where he had opened the Lashings Beach Café and Inn. While he was there he met West Indian captain Richie Richardson, who was about to retire from international cricket and was looking for a fun, no-pressure environment in which to play and rediscover his love for the game. Two and two were soon added together and Richie agreed to come to England and play for Folb’s local team. The news of Richardson signing for Lashings was greeted by hoots of derision by the local media, who simply couldn’t believe that such a high-profile name was coming to play for one of Kent’s smallest cricket teams. News of Richardson’s contentment within a small team in Kent soon travelled throughout the cricketing world and soon Folb was finding interest from other high-profile names coming towards the end of their careers. This gave him an idea: to form an all-star cricket team, like a cricketing equivalent of basketball’s “Harlem Globetrotters”. Thus, the seeds were sown for the team that is now known as the Lashings World XI. Some of the early signings included Muttiah Muralitharan, Brian Lara, Shoaib Akhtar and Sir Viv Richards and soon the Lashings team were travelling the country, taking on (and usually beating!) all comers, including several of the first class counties! As well as playing cricket, the team does tireless work for charities and does all it can to promote and raise money for worthwhile causes. In 2000, Lashings were the first team to travel to Montserrat after the volcano crisis, they travelled to South Africa in 2005 and gave coaching to the underprivileged in the townships and in March 2006 Lashings were instrumental in putting together the Sport Relief Red Socks team that travelled to India with coaching and guidance from former Lashings World XI manager Alvin Kallicharran. Closer to home, Lashings have helped to raise hundreds of thousands of pounds for all manner of charities, including the African Caribbean Leukaemia Trust, Cystic Fibrosis, MENCAP and Our Forgotten Children. 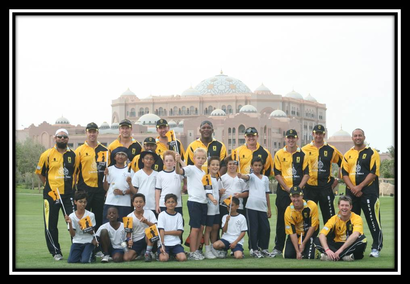 In amongst it all, the team still sticks to its original credo of “fun, first and foremost” and continues to make an impact at all levels of cricket with the club’s striking “Rude Boy” logo and their unique black and gold clothing, aiming to raise the profile of the game of cricket all over the world and to help others less fortunate than ourselves through the medium of sport. Lashings World XI - click here for a short video presentation on the world's greatest cricket club...after Brentwood! Lashings World XI - click here for the club website and all the latest news from Lashings World XI.